This page provides additional information for teachers after they have claimed their accounts (see Claim My Account if you haven't already done so). For the initial rollout of NCEdCloud IAM Service accounts, many LEAs felt it would be more appropriate for teachers to provide the username and password to their students (this was always the approach for K-5 students). This is described in Issuing Student Accounts below. LEAs and Charter Schools may of course choose to let their older students (grades 6-12) go through the claim account process described in Student Account Claiming. 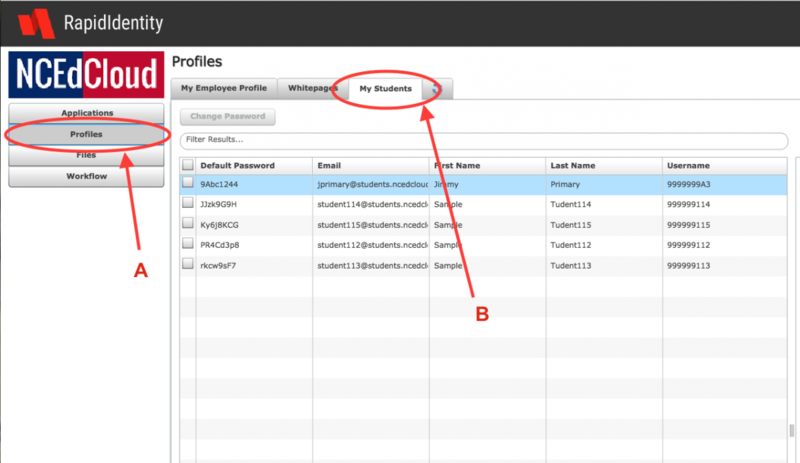 If teachers will be issuing accounts to their students (username and password) they will do this by going to my.ncedcloud.org and logging in to the IAM Service on the Rapid Identity Portal. There is a great 3-1/2 minute video which walks you through the entire process under the Training Icon on the Application Access page. Click on Training and "End User Training", and look for the video "What can I do as a Teacher within the NCEdCloud". It walks you through how to view your students and print out a copy of their logon information. There is also a recorded webinar on the Resources page - "Webinar on End User Experience with the IAM Service". To actually see your students and print out a copy of their information, click on "Profiles" - A and then "My Students" - B, and follow the process described in the video. Note that for students in grades 6 and higher, at their first login they'll be prompted to answer at least 5 challenge questions (students in grades 5 and lower will not have to enter answers to challenge questions).